Then it's off to openCanvas for the background. I kinda wanted to throw stars on there, that's why I made it dawn instead of dusk (and, purple is such a nice colour X-P). The beach and cliffs are painted using this scan as reference. I phail at making waves DX ... The only thing not made from scratch is the stars, which came from a brush. Good luck in the contest too! great painting and it looks so pro to me. Great wallpaper! 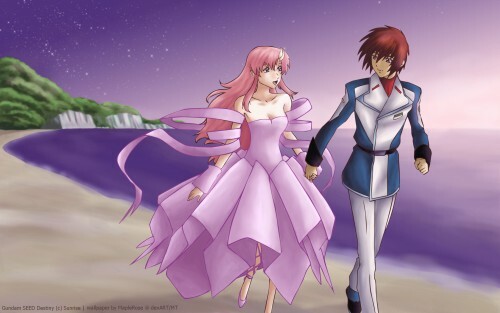 I love Kira and Lacus together. The softness of the sunset really suits them. Nice choice of the scenery color especailly purple water, but the purple sky must've seen odd to me. ^_^' Though being fantasy about it I really don't mind at all. Two people are in love with to together. Cool ! i likes this wallpaper it perfect on my screen !